Oh man, what a long day. A reminder that I lost my camera yesterday, so the rest of this leg will be iPhone photos until I get my new camera in town. Gavin and I got going by 6:30am and Katherine left about 20mins before us. All of us had a big day planned. 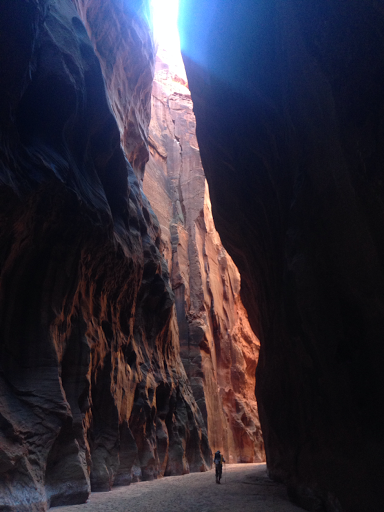 The Buckskin/Paria area has limited overnight permits for good reason, but unlimited for day hiking. 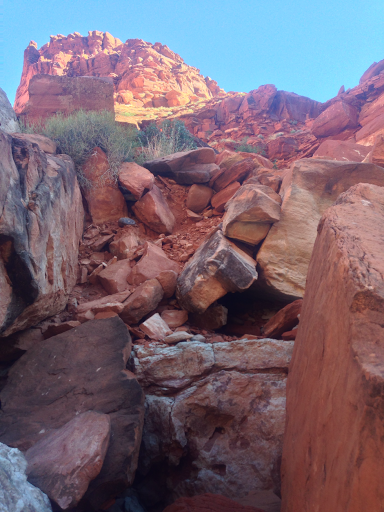 In order for us to do this properly, we have to exit each night and climb up to get out of the permit area. Today that would require a 25mi day with a BIG cross country climb that last mile. 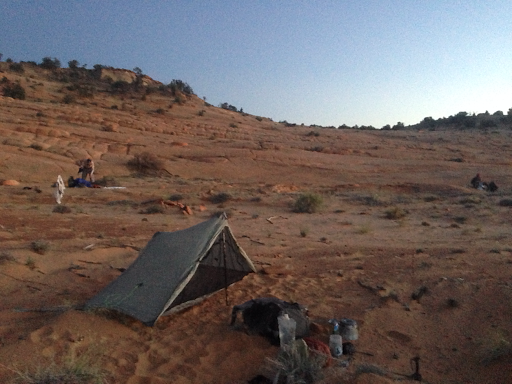 If we couldn’t make the miles, we could easily camp anywhere along the Paria and not get caught, but we wanted to a) Respect the system and environment. b) See if this physical challenge could be met! 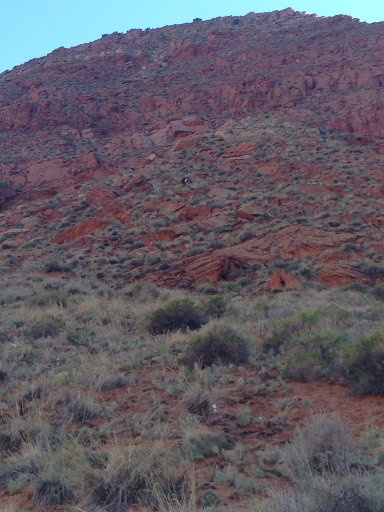 At the end of the day yesterday, we climbed out of Buckskin Gulch at mile 6 (of 13) on the sketchy middle exit. We had to climb back down it this morning. 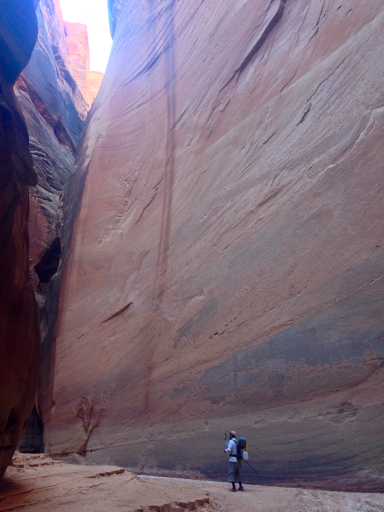 Many would not be comfortable doing this without a rope and it definitely has its exposure with angled rock that is covered in sand for poor traction. I had great photos yesterday and got some more today since I lost the camera. The key to knowing you’re in the right place is the sheep petroglyph at the bottom of the climb I posted a photo of yesterday. 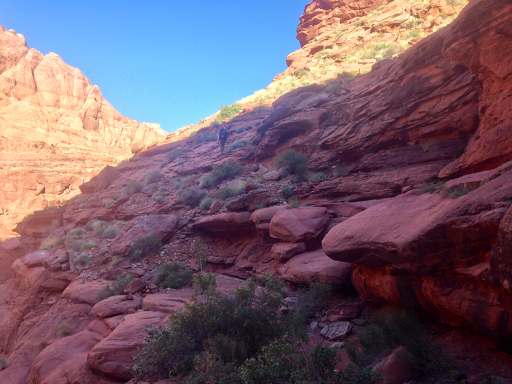 Near the top is a steeply angled ~15ft wall of sandstone I would never have been comfortable trying to climb. If you walk around the corner, there are cairns indicating an angled traverse with exposure that isn’t my favorite thing to do, but it is the less intimidating of the two choices. 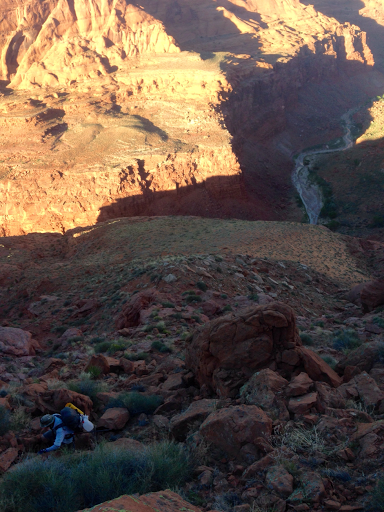 So, we first did the traverse of 10-15yds. When we got across, we were at the intimidating wall I wouldn’t have even attempted to go up/down. That’s when we saw Katherine’s footprints. She had missed the traverse and mentioned last night the exposure and surprised I did it…now I see what she did, whoa! 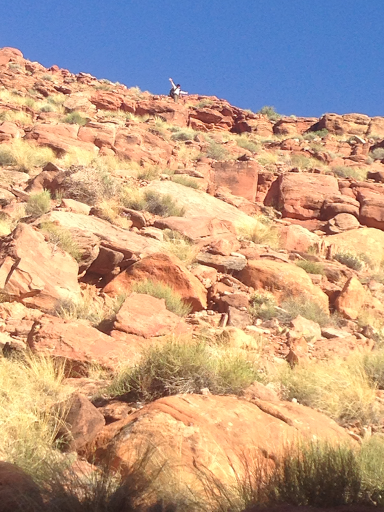 I totally forgot to get a photo at the bottom looking up, but got some of Gavin climbing down. 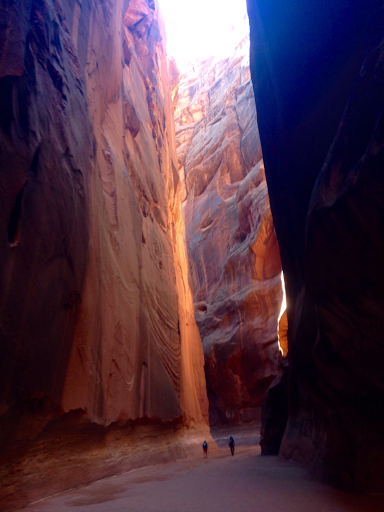 The first one is the exposed traverse. 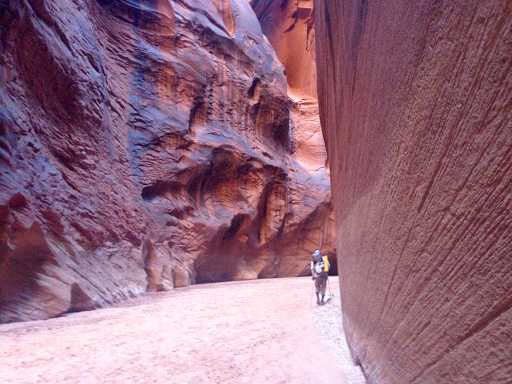 Then we had about 6mi of the wonderful Buckskin Gulch. I had some really amazing photos yesterday on the now lost camera, but was glad I had today to take some more to give an idea of what we were in. So many photos! They are slightly darker since it was early morning. After awhile, it widened up a bit. Later in the morning, we crossed many of the permitted campers and everyone was really enjoying the trip. 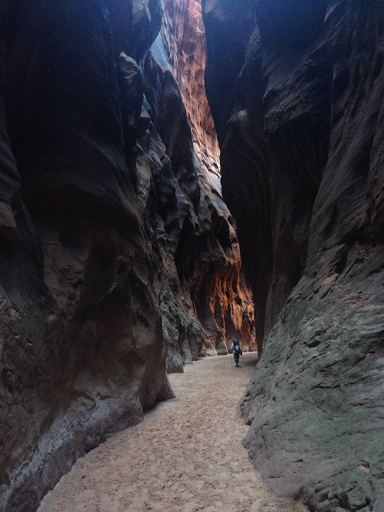 The second half of Buckskin Gulch after middle exit was dry and we didn’t have to wade through that deep ice cold water again, so that was good. 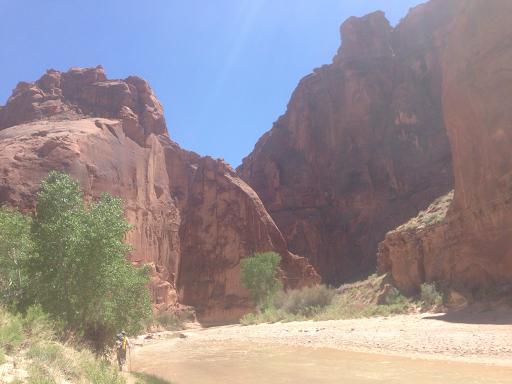 After the 6mi, we hit the confluence of the Paria River (yep the same river we were in a week ago). This time, it was much more scenic and enjoyable. We were still crossing it much of the day, but there was less slippery thick clay mud and the water was ankle to thigh deep. 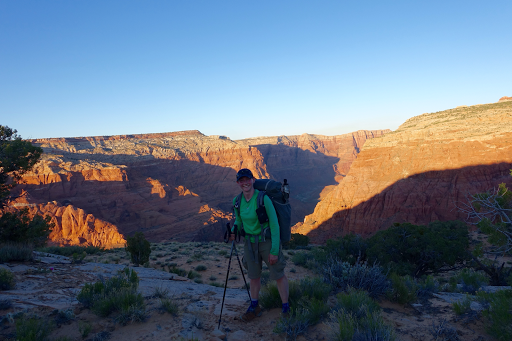 In the morning, the water was colder before the sun fully rose to fill the canyon and my feet were cold enough that I caved and put on the neoprene socks. They worked nicely and I wore them the rest of the day, even though the water warmed as the sun came over us. 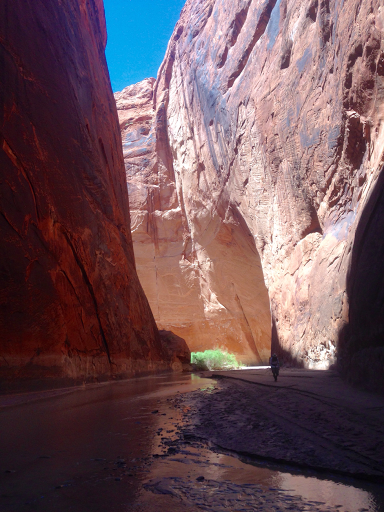 The canyon opened up more and we did about 18mi of the Paria River. My bad ankle has been in a brace since Monday Canyon and likes to yell at me throughout the day. It was especially argumentative today due to the resistance as I pulled it through the water and the rocky terrain in the cloudy water. 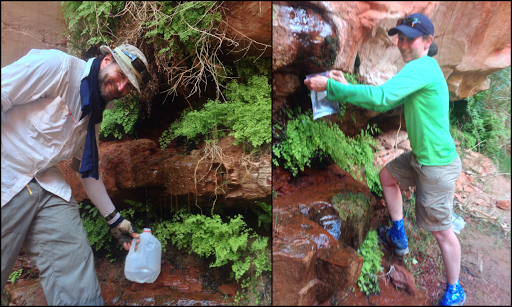 Our water sources today came from springs coming right out of the canyon walls. We saw Katherine in the morning at the spring and again in the late afternoon at our last spring. The final one was seeping out in dribbles. We weren’t sure of the quality and reliability of the water tonight or tomorrow, so we each needed many liters. Gavin just left his jug under some of the drips and I used the Ziplock method. You all know I love my creative uses for Ziplocks and always carry extras. So after about 24mi of hiking, we had the grand finale of the day. 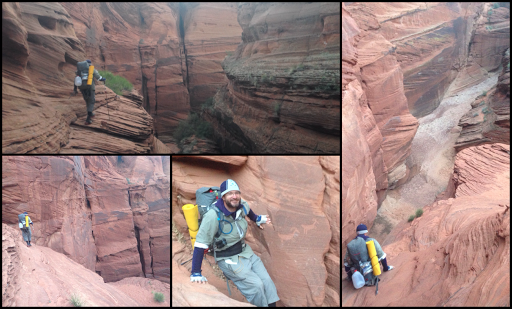 We needed to climb up and out of the canyon through a Nic Barth route. He somehow found all these great alternate routes before he did the Hayduke in 2013 by examining Google Earth. This one is quite the climb! 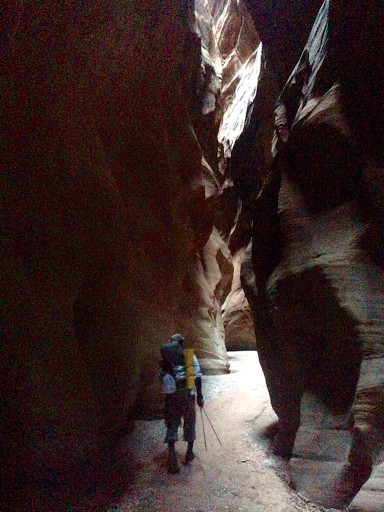 Known as the Bush Head Route, it climbs pretty much straight up 1800ft in just one mile. Katherine was just a few minutes ahead of us on the climb, which was good so we were spread out enough to safely avoid all the loose rock that might fall. She helped me by lifting my pack up a 10ft climb and hiked on as I helped Gavin. It was great to have Katherine ahead to really put it in perspective in the the photos. The 1mi climb took 1hr 40mins. There wasn’t a trail, it was just basically choose your own adventure to the top and all involved dodging cacti and loose rocks. It was definitely the challenge we’re all out here for and was, dare I say, fun! Look closely for Katherine in the center. 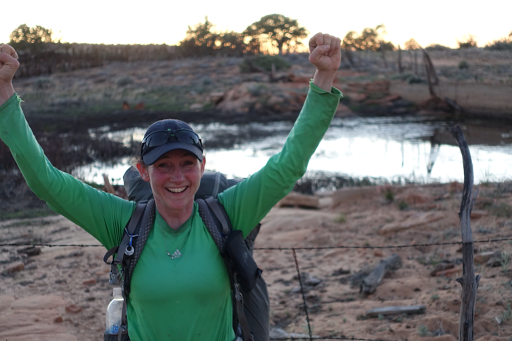 It was well past my preferred camp time, but once on top and soaked in sweat, we were only 1.2mi from the next possible water source, a “tank” which in this case meant a swampy mucky oversized puddle. We all wanted to know how much of our supply we needed to conserve depending on that source, so we hiked on and got to camp at 8:20pm, which is really late for me. We added up the miles and realize it was 26.2mi, an exact marathon! I love it when my thru hike days randomly land at 26.2 and it was the perfect end to another classic day on the Hayduke (technically an alternate). Here is me celebrating this victorious marathon day at the water source I DID NOT choose to use, blech. We setup as the sun set. At over 6,000ft, the sunset and stars were stellar. To top it all off, I got some internet and stayed up pretty late texting and checking email. What a great day!